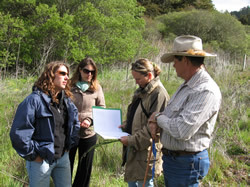 The RCD provides technical assistance to landowners, farmers, ranchers and other land managers in Santa Cruz County. We provide planning and design services for a range of resource protection and conservation practices including erosion control, water quality protection, groundwater recharge, habitat enhancement, flood management, irrigation efficiency, and nutrient management. The RCD and its partners also provide a range of project design services including (but not limited to) hydrologic analysis, engineering design, vegetation plans, and irrigation system design, and GIS mapping. 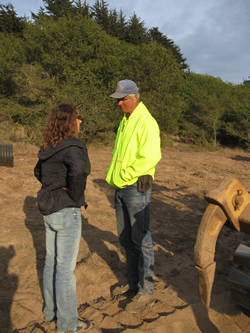 We also provide site assessments to Santa Cruz County landowners, growers and ranchers to evaluate resource concerns and outline the steps required to develop solutions to resource problems. If you would like more information or assistance on your property, please contact us. Site Assessment: a short property visit to discuss land use concerns, potential solutions, and design constraints. Conservation Planning: A Conservation Plan considers site specific characteristics such as soils, hydrology, land use, habitat and landowner needs, and helps landowners assess costs associated with Best Management Practices (BMPs) and resources for implementation. Project Design: Project designs may include restoration plans or full engineered designs. Construction Oversight: A plan or design is only the first step in a successful project. Effective construction oversight is key to ensuring a project is built correctly and will perform according to everyone’s expectations. Monitoring: Monitoring is desirable – and may be required - during all phases of construction. Some projects require monitoring for sensitive wildlife and plant species before, during, and/or after construction. Monitoring can help property owners, project funders, or agencies evaluate the success of a project; or help determine BMPs for future projects. Funding may be available to assist landowners who are interested in technical assistance.